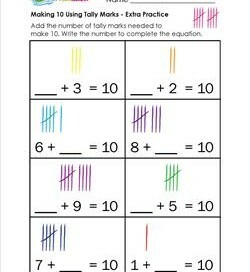 Here’s another way kids can practice making 10 – using tally marks! 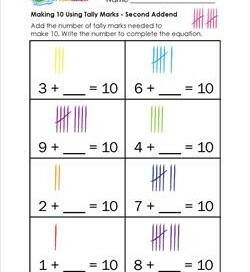 In this set of worksheets kids count the tally marks already in the problem, draw the needed number of tally marks to make 10, and fill in the missing addend. 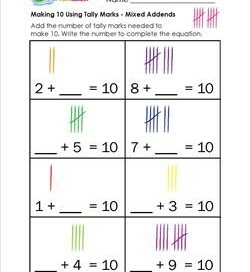 The worksheets have a selection of only the first or the second addend missing and a mix of both addends missing. 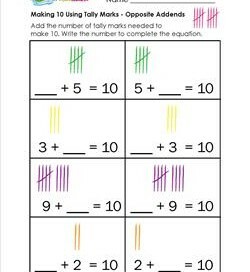 Early finishers can create their own tally mark addition problems on the back! Please go to this page to see all the kindergarten addition worksheets on this site. Tally mark time! 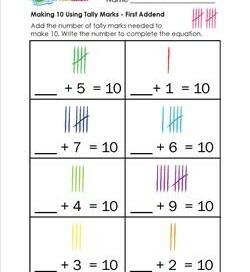 These colorful tally marks are here to help kids become excellent at adding to make 10. Fill in the first addend in each equation. In this worksheet the first addend is provided and children must fill in the second addend. Count the tally marks and draw more to make ten. This worksheet really mixes things up! Kids count the tally marks and draw more to make 10 and write the number in the first or second addend. In this worksheet the same number is used in the first addend in one problem and the second addend in the next problem. Fill in the missing addend. 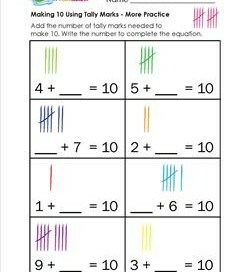 This worksheet provides more practice making 10 using tally marks. These tally marks are standing straight and tall. Can you make more just as straight?